Capitol Opera Richmond is an all-volunteer organization that provides a performing venue for local singers, musicians, directors, conductors, choreographers and dancers. Their latest project is Henry Purcell’s “Dido and Aeneas” (1688) and features a partnership with Jefferson Baroque, the Latin Ballet of Virginia and Quill Theatre. 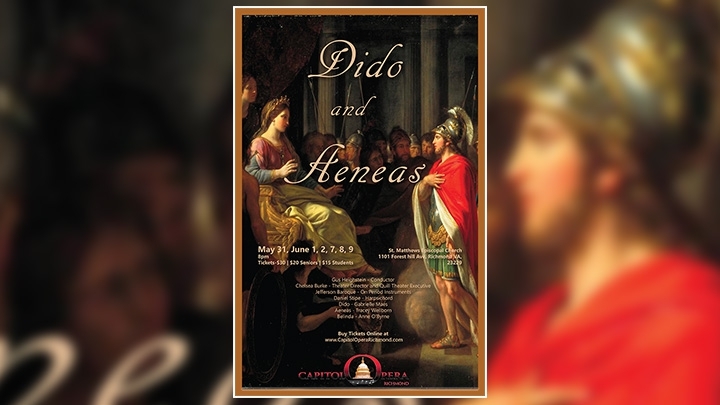 Dido and Aeneas is the only “genuine” opera by Henry Purcell and is one of the earliest English operas. Gabrielle Maes, who plays Dido, and Raphael Seligmann from Jefferson Baroque stopped by to chat with me about the production, which runs through June 9th at St. Matthews Episcopal Church in Richmond.